Walnut trees grown for the nut industry are usually open-grown trees with large crowns to produce a high volume of fruit, versus timber trees with a narrower crown producing straighter trees with fewer limbs. Walnut trees should begin producing nuts regularly on a good site when they are 8 to 10 years old or 15 to 25 feet tall. Many black walnut trees may bear only irregularly or during alternate years, but you can select those trees that regularly bear when you thin the plantation. Several cultural factors can influence flower production, fruit set, and fruit maturation. Because female flowers are formed within the dormant buds when the current year's nuts are rapidly enlarging and filling, the immature flowers must compete with the nuts for carbohydrates produced by the leaves. Cultural practices such as fertilization increase the number of new flowers formed in the buds. To provide the nitrogen needed for good fruit set, walnut plantations should be fertilized according to their cropping potential. For every 100 pounds of freshly husked nuts harvested approximately 15 pounds of nitrogen must be added either though nitrogen-based fertilizers or legume cover crops. Moisture stress, especially during July and August when the nuts are rapidly enlarging and filling, will drastically reduce nut production and quality. Be sure that your trees get the moisture they need. See Growing Black Walnut for Nut Production for more information. A bushel of freshly collected nuts weighs about 48 pounds and contains about 375 nuts. To keep the nuts from overheating and losing kernel quality, spread freshly collected nuts out in shallow piles until husked. Wear rubber gloves when handling nuts because the hulls contain chemicals that can irritate and blister the skin. Husked nuts can be stored in open mesh bags and allowed to air dry. Nuts to be used for seed must be kept moist and prepared for stratification. Nuts are usually purchased on a green hulled weight basis by local agri-business firms who are supplied with walnut hullers by walnut processors. Harvested nuts can be sold to local nut hulling operators in your area in October. After husking, about one-third of a bushel of nuts weighing 18 pounds will remain. When managing a plantation for nuts and timber, you should evaluate the nuts from some of your best trees. Trees that consistently produce nuts with more than 4 grams of kernel, kernel percentages higher than 20 percent with more than 50 percent of kernel extracted as quarters, and fewer than 20 percent blind nuts are worth further evaluation and possible propagation as new cultivars for timber and nut production. This information was adapted from Walnut Notes, J. W. Van Sambeek, author. 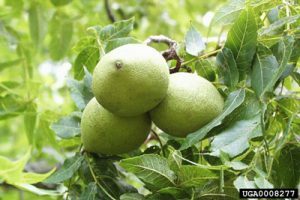 Missouri Center for Agroforestry supports the nation's most comprehensive research programs for developing the eastern black walnut as a nut crops for agroforestry practices. Their research includes developing improved nut cultivars with higher yields and better flavor. The Northern Nut Growers Association, Inc. (NNGA) brings together people interested in growing nut trees. Their members include experts in nut tree cultivation, farmers, amateur and commercial nut growers, experiment station workers, horticultural teachers and scientists, nut tree breeders, nursery people, foresters, and beginning nut culturists. Harvested black walnuts are processed into nutmeats. Black walnut extract flavoring is also made from nuts, as well as black walnut ice cream and other desserts. The shells are used in the abrasives industry. Hammons Products Company of Stockton Missouri is the primary US producer of nutmeats and abrasives made from black walnuts. Black walnuts are recognized as one of the most healthy tree nuts, low in saturated fats, high in unsaturated fats, and a source of protein (24.1 grams in the edible portion of 100 grams of Black Walnut food), the nutmeats are also a source of Vitamins A, iron, minerals and fiber.